Culverts and water - the lifeblood of salt marshes Salt marshes need a daily dose of seawater in order to thrive. Humans have interfered with the natural flow of seawater to and from marshes by building roads, railroads, and dikes over marshes. Water is then channelized into culverts, many of which are too small to allow adequate seawater to inundate the marshes or to drain from the marsh at low tide. Small culverts in the Great Marsh region area are being replaced with larger ones that let more water pass through. This allows the salt marsh to expand and thrive. Invasive Species Invasive species are one of the most profound threats to the natural world. The Great Marsh is threatened by several aggressive, nonnative, invasive plants. Common Reed (also known as Phragmites) generally spreads from the upper edge of the salt marsh out over the marsh surface. A more recent invasive threat to the Great Marsh is Perennial Pepperweed. This grows at the upper edge of marshes and at the top of creek banks, where its seeds can be spread by the tides. The Great Marsh Coalition has active programs to control these two invasive plants: restoring the natural hydrology where it has been altered by humans, herbiciding, prescribed burning, mowing and pulling out invasives by hand. Sea level rise Coastal communities are bracing for a sea level rise anticipated by scientists to be somewhere between one to four feet by the end of this century, possibly higher. Rising seas will likely cause profound changes in both the ecology and culture of coastal communities. Cherished landmarks, such as Motif # 2 in Essex, along with houses, businesses, and roads that cannot be moved back, may succumb to the ravages of these higher sea levels combined with the predicted more intensive coastal storms. Similarly, salt marshes that cannot migrate into an adjacent upland area or build up in elevation as fast as seas rise will be lost. Marsh migration into uplands Since the beginning of the Industrial Revolution, 150 years ago, the rate of sea level rise in New England has tripled. Some marshes in New England are already drowning and eroding rapidly under rising sea levels. Land protection has an important role to play in insuring the future of salt marshes. As sea level rises, the land between low and high tide will move into upland areas that currently border marshes. Marshes can move into these new intertidal areas if the land is undeveloped and has no barriers to marsh migration such as seawalls. The key is to make sure that lands that could support future salt marshes remain undeveloped. 'Climate Change and the Great Marsh' was sponsored by the Great Marsh Coalition (GMC) and funded in part by an Essex National Heritage Partnership Grant. 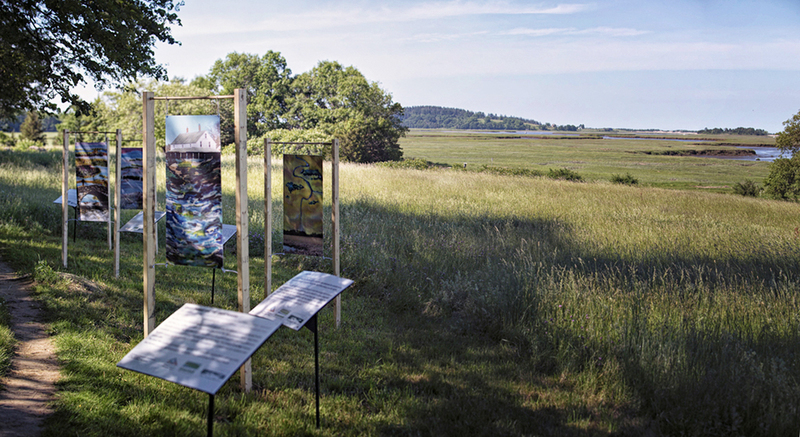 The four panels and interpretive text were exhibited June 2015 - November 2015 at Essex County Greenbelt’s Cox Reservation in Essex, MA, Rough Meadows Wildlife Sanctuary in Rowley, MA and at the Crane Estate Art Show, The Trustees of Reservation, Ipswich, MA. Essex County Greenbelt Association, Cox Reservation, Essex MA. "Ms. Quateman was inspired to create the installation as a result of attending the 2014 Great Marsh Symposium organized by the GMC, which focused on climate change and presented case studies in local adaptation. The artist, who is an environmental planner was drawn to weave together her passion to protect vulnerable landscapes by painting on silk to illustrate the effects of climate change on the landscape of Essex County. Ms. Quateman’s work reflects her inner vision to the outside world. 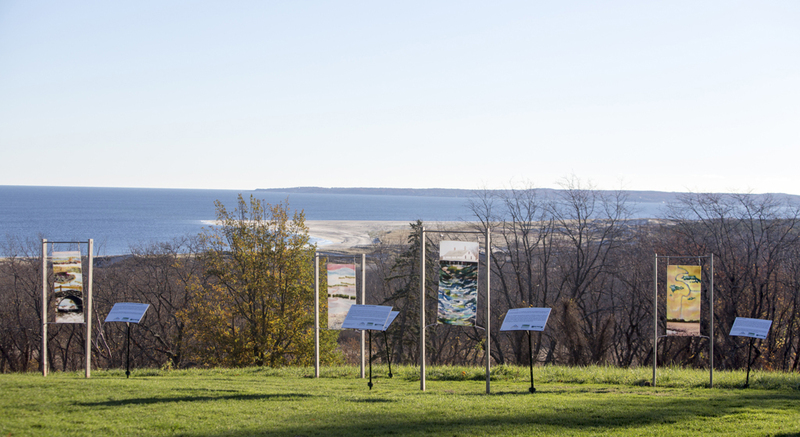 The four painted silk banners are designed to reach people at an emotional level, illustrating marsh climate change challenges and solutions, striking at the core of the Great Marsh Coalition’s mission. The panels include the problems of invasive species and marsh inundation, as well as solutions of land protection and salt marsh restoration. “Ms. Quateman’s banners serve to raise public consciousness on the issue of climate change within this area of critical environmental concern,” said Ed Becker, Greenbelt’s Executive Director and member of the Great Marsh Coalition. “We hope the works can help inspire and provide perspective on the important challenges that climate change and sea level rise will bring to our region,” Becker continued."